Max has a stroller a therapist once gave to him that's for kids with disabilities. He's too big for it, but still loves pushing it around, empty. I've struggled with this as it's not doing his image any favors and yet, it's an activity he loves. This weekend, though, I found new peace with it. It was an unusually warm winter day on Saturday. 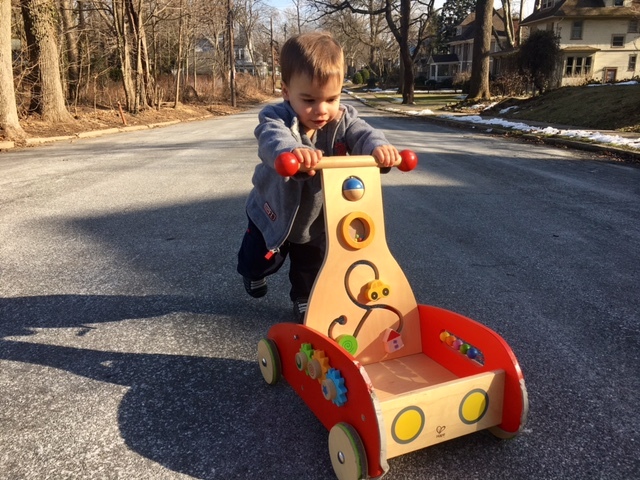 For the first time, Ben got to wheel a push-toy around our neighborhood. He was gleeful; I felt the same watching him and excited, too, that he wasn't clipping bits off the furniture. Max decided to join us. 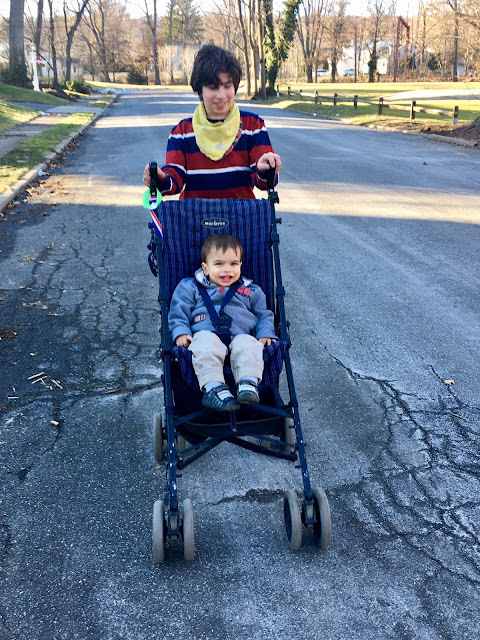 I got his stroller out of the garage and he and Ben did laps together. Max kept smiling down at Ben, laughing when Ben made some happy noise and saying "No, Ben!" when he bent down to pick up dirt or tree branches. Occasionally, Ben would smile up at him adoringly. Sabrina came out and rode next to us on her bike for a bit. I flashed back to when Max was little. At two and a half, he had just started taking independent steps. He used a walker that had wheels and he'd cruise up and down our street like a speed demon. Dave and I joked about renting it out to other kids, since they thought it was cool. And now here was Max, strolling so confidently and contentedly next to Ben. I had one of those he's-come-a-long-way moments. 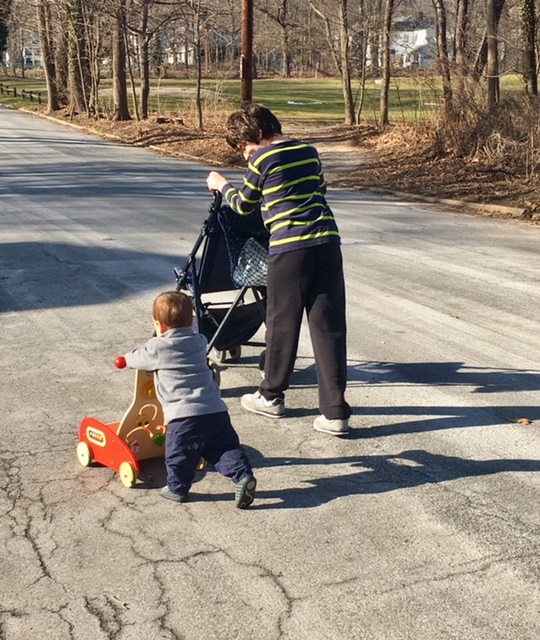 And as I watched my boys, each enjoying his own sets of wheels, I had an equally reassuring he-is-who-he-is moment. By the next day, Max was giving Ben rides. This is the cutest thing that I've seen all day! This is a wonderful little slice of life! And just like that, you have two brothers destined to be best friends forever.